Together with my colleague Gwenda Schlundt Bodien, I developed a model describing four different types of situations requiring different solution-focused roles. We call it the 4SFC-model (four solution-focused competencies model). Here is that model and below it is a brief explanation. Internal goals: goals that originate from within the indiviual or group. External goals: goals that originate from outside of the individual of the group (for instance organizational goals). Internal solutions: solutions that originate from within the individual or group. External solutions: solutions that originate from outside of the individual or group. Helping: this role is required when the purpose of the session is to facilitate an individual or group to find their own solutions in order to make progress in the direction of their own choice. This is role is required most frequently by therapists and coaches (who have no direct interest in the outcome of the process). Directing: this role is required when the purpose of the session is to take care that the individual or group will meet the requirements of some superimposed goal. This role is most frequently appropriate for managers, teachers and customers, in other words people who have an interest in the outcome and the authority to interfere with the work of the individual or group and have the right to put certain demands on them. Training: this role is required when the purpose of the session is to make available external solutions (knowledge, skills, problem solving approaches) for individuals or groups in order for them to use it to achieve their own goals. The solution-focused trainer has no interest in the outcome and will not interfere with to what extent or in what manner the trainee will eventually use the solutions. Instructing: this role is required when the purpose of the session is to clarify the required outcome of the session and the way the outcome has to be achieved. This role is most frequently used by managers and mentors or teachers in situations in which the individual or group can not be expected to already have internal solutions. An example is a manager explaining a procedure to a new employee. Directing: well formed goals (goals which are formulated in concrete positive results terms), using questions to provide direction (how can you ....(requirement).... so that .... (positive reason to ask this), identifying, appreciating and using what is already there, working with what comes back to you, acknowledging what the individual or group is saying, inviting small steps, leading patiently and persistently, creating an expectation of positive change, normalizing, reframing. Training: the usefulness question, the platform technique (identifying and using what is already there), the earlier successes question, working with what comes back to you, approaching resistance as cooperation, creating an expectation of positive change, the leapfrogging technique, for instance by means of the solution-focused time quake. I can't understand why you haven't credited Blanchard, who invented situational management, (and is famous for the one minute manager books) with the 2x2 matrix? 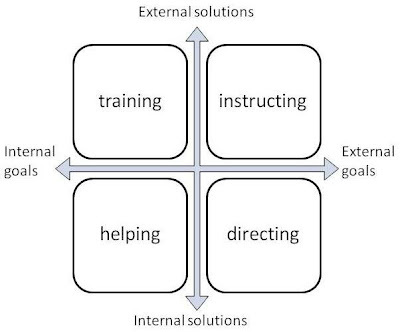 I am aware that Paul Hersey and Ken Blanchard developed the idea of situational leadership and also used a 2x2 matrix. I certainly don't mind mentioning their names but I think their model is quite different and we did not base our model on their model. Their model is about leadership, ours is not. If you study both models you will see that the axes in both models are very different. So, while I think crediting people is important, I think credit to these two authors in this situation is not right. What about the place of coaching then? I thought solution-focused fits nicely with coaching, or the other way round? We've avoided that word in this model because so many people define it in so many different ways. But the way I use the word coaching resembles 'helping' in the model.